The whole order is including 12 buttons remote ,20pcs 1 cue receiver and a package case. Do you find this remote firing system is a little stange? 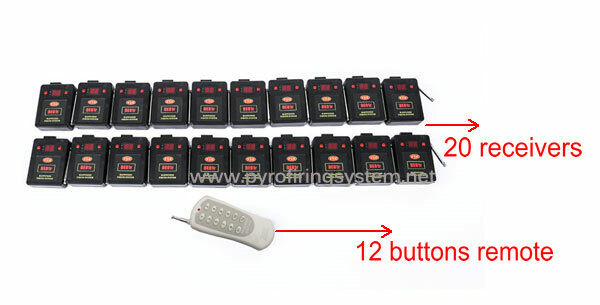 It is use a 12 buttons remote to control 20 receivers. How does it work? And you will find another strange thing. That is all the receiver can adjust to the same channel 01. That means if you press button 1, all receivers will fire. Here the channels was set 08,09,10. Here the channel is 01,02,03. That means you can select any channel if you need.